We have our Kit on our website available for Pre-Order. Reserve your kit now and we will ship it to you on November 1st if you can not make it to the shop! Click here to pre-order your kit. Click on the picture to order. We can ship these to you now-we do not have to wait for the summer! Never participated in Row by Row? I'm a quilter, how can I participate in Row by Row Experience? It's easy! 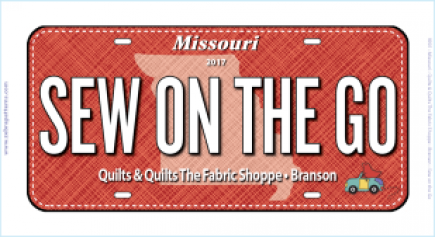 Simply visit any participating 2017 Row by Row quilt shop during the summer and ask for their free pattern for a row in a quilt. The 2017 theme is Row by Row On the Go, and each shop is working with the theme in their row. The shops are happy to give you the pattern at no cost, limit one per person, walk-in customers only. Kinda. But there are no fees and no cards to stamp. Yes! With the Row by Row Experience you win a prize for sewing! Complete a quilt using at least 8 different rows from 8 different 2017 participating shops. Be the first to bring it into a shop and you win a stash of 25 fat quarters. (That's 6-1/4 yards of fabric!) Win a bonus prize for using that store's row in your quilt. You decide. Stack your rows, arrange around a center medallion, make them horizontal, vertical, upside down, on the front, on the back, whatever! You are the designer. Be creative and have fun, but be sure to use 8 different 2017 rows from 8 different 2017 Row by Row shops. Lots! Each shop is participating in the Row by Row Experience in their own way. 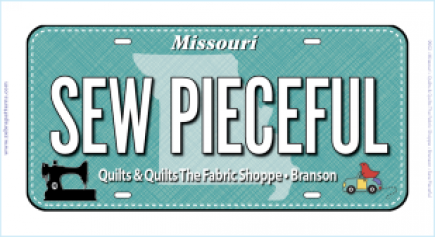 You will be able to buy kits for the rows you love and see demos for new quilting products when you visit many of the shops. Many others are carrying the FabricPlates from Zebra Patterns and the coordinating Row by Row On the Go fabrics. Come into the store to get your FREE pattern! You can also pick up our kit if you love our colors. Free patterns only to customers that come into the shop. One of the only rules of the hop is that you, the customer, has to come into the shop. Please do not call and ask us to email or mail you patterns- we do not make the rules nor are we in a position to change the rules. Patterns will be available for purchase starting November 1st. This is the 'Winning' or 'Hibernation' Period. We are not allowed to give out, sell, ship, or email patterns or kits in anyway. We will take orders for patterns or kits to be mailed after November 1st. Prices for the patterns and kits are still to be determined. The dates are put into effect by the creators of The Row by Row Experience. Please do not ask us to bend the rules, they are not ours to bend. We follow the same rules for EVERYONE. Thanks for understanding! Both the pattern and the kit will be available for purchase. If you need them mailed, the shipping charges will vary based on what you order and where you are in our wonderful world! The patterns are not free after the hop is over. You must COME IN to the Shop to get a FREE Pattern during the Row by Row time frame. Federal Copyright laws and Row by Row Experience do not allow you to copy patterns for your friends or family. If we find out you are copying our COPYRIGHTED pattern for anyone, we will press charges. Our pattern clearly state they are copyrighted and copies are not allowed. COPYRIGHT Infringement is a FEDERAL crime. Just because we offer the pattern for free for a limited time DOES NOT give you the right to copy it for your friends. We spend a lot of time and money to design a beautiful row with a high-quality professional pattern.